There are 10 types of easels that artists use, each with a slightly different purpose. If you want to buy an artist easel but you're not sure which type to get, this Handy Overview of Artist Easels will demystify the process! 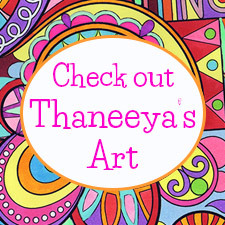 I'll explain the differences between the various types of artist easels, helping you figure out which artist easel is the best match for your needs. Each type of easel has its own characteristics and uses, which makes each type specially suited to specific types of art-making processes. 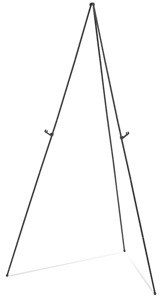 A-frame easels (also called Lyre easels) are triangular shaped easels with 3 legs – 2 in front and 1 in back. When you look at them head-on, the shape resembles the letter "A", hence the name. 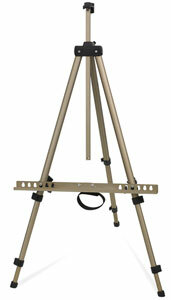 This triangle shape makes it easier to tuck the easel into a corner, if space is at a premium. 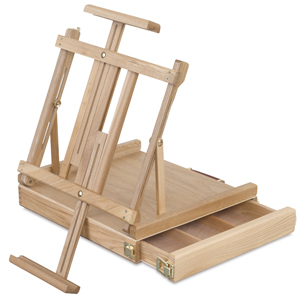 These types of easels are easy to store because the rear leg can be pushed forward, which flattens the easel for storing in closets or whatnot. The price range for A-frame easels ranges from $50 - $250. Depending on the specific model, A-frame easels can hold canvases as large as 38" to 75", and they can easily handle anything smaller. They are not as sturdy as H-frame easels or Giant easels, so if you typically work on a large scale, consider a different type of easel. A-frame easels are ideal for: people with limited space who work in a small to medium scale. H-Frame easels get their name because they are shaped like the letter "H". These types of easels usually have a strong base that makes them sturdier than A-Frame easels. The downside is that they take up more room and aren't as easy to fold up and hide (although there are some smaller models available for those who live in tight spaces.) If you have a dedicated studio space where you can leave your easel up indefinitely, then an H-Frame easel is well worth the investment. They can handle bigger canvases than A-Frame easels. 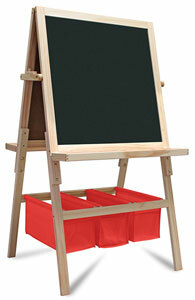 Depending on the specific model, some H-Frame easels have handy paint trays for storing art supplies. Some can also be collapsed for storage - although even in a collapsed state, an H-Frame easel will still be more clunky and bulky than an A-Frame easel. Many of them can handle canvases up to 84" – 96".The price range for H-Frame easels ranges from $90 - $1460. H-Frame easels are ideal for: artists who need stable easels and the ability to work on large canvases. Giant easels are aptly named because they are designed for artists who work in a large scale. If you frequently work on canvases larger than 8 ft (what a doozy!) then a giant easel is for you. These types of easels are extra strong and sturdy, so they can support the extra weight and size of large canvases. Depending on the specific model, giant easels can handle paintings up to 85" – 120" tall. Giant easels are bulky and heavy, so they are not easy to transport or store like most of the other types of easels. The price range for giant easels ranges from $300 - $1800. Giant easels are ideal for: serious artists who regularly work in a large scale in a dedicated studio space. Convertible easels (also called hybrid easels) are one of the most fascinating types of easels because they can "convert" from being a normal easel to becoming a table top! This is handy for artists who work in a variety of media. For instance, acrylic and oil painters need to work with their paintings upright on an easel, while watercolor painters and pastel artists may prefer a more horizontal surface, like a table top. 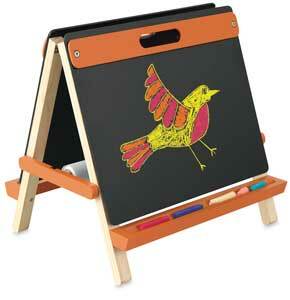 If you need both types of surfaces, this easel is perfect for you. Depending on the specific model, convertible easels can handle paintings up to 84" tall. Some also include a paint tray for holding your supplies. Convertible easels are generally sturdier than A-frame easels, but they require more space. The price range for convertible easels ranges from $90 – $750. Convertible easels are ideal for: people who frequently work in more than one media. Single mast easels are simple and affordable. 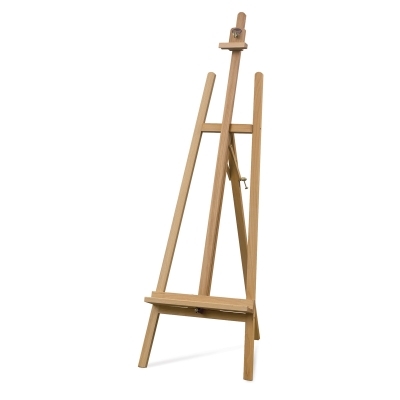 These types of easels are not as sturdy as H-Frame or even A-Frame easels, but they can get the job done for beginning artists, art students, or anyone who needs an easel that is easy to store. Depending on the specific model, single mast easels can handle paintings up to 72" tall. The price range for single mast easels ranges from $42 - $600. Single mast easels are ideal for: people on a budget who live or work in cramped quarters. 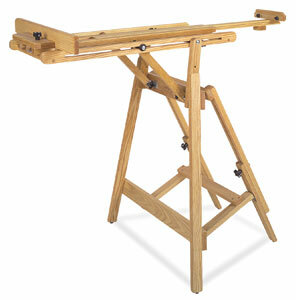 Table top art easels are perfect for artists who work in a small scale. As the name suggests, these types of easels are small enough to place on a table top, which makes them very portable. Since they don't take up a lot of room, they can be easily stored away. Tabletop art easels are available in A-Frame, H-Frame, and single mast designs. Some contain a drawer for holding art supplies, which is handy for artists who need to take their easel and supplies to and from home and school, for example. Depending on the specific model, some tabletop art easels can hold paintings up to 32" high. The price range for tabletop art easels ranges from $15 - $200. Tabletop art easels are ideal for: artists who work in a small scale and don't need a full-size easel; artists who have limited space; artists who need a portable easel. 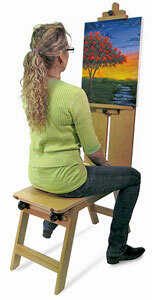 Plein air easels are designed to be taken outdoors. The best models are easy to carry and easy to set up. They have tripod legs, and are made from wood or aluminum. French-style plein air easels contain built-in drawers for painting supplies, and a shelf for holding a palette. Some can also carry canvases. 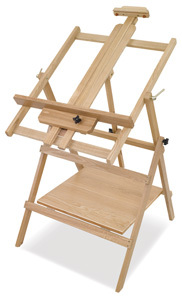 Depending on the specific model, some plein air easels can hold paintings up to 45" – 78" high. 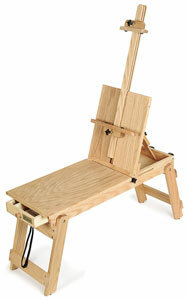 The price range for plein air easels ranges from $17 - $500. 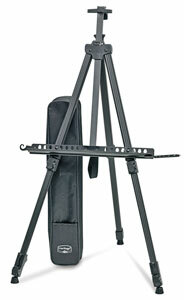 Portable easels are ideal for: plein air artists who need a lightweight easel that is easy to carry and easy to set up. Bench easels are neat because they are a combination of an easel and a bench. This is really handy for plein air painters or artists giving demonstrations. 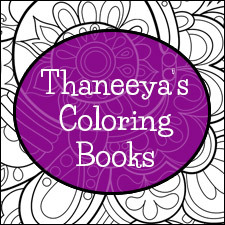 They collapse into a portable position, so you can take them with you when you paint on-site, without needing to lug around an additional chair. The two models below have wheels for easy transport. Depending on the specific model, some bench easels can hold paintings up to 24" high. 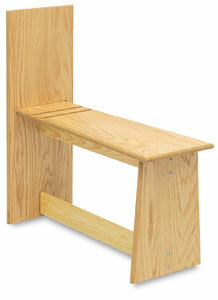 The price range for bench easels ranges from $230 - $400. Bench easels are ideal for: artists who paint outside. Display easels are meant for just that – display. These types of easels are not meant to be used for painting, because they are too flimsy. Also known as decorator easels, these easels include those that have unusual or whimsical designs, allowing for an aesthetically-pleasing presentation. Depending on the specific model, some display easels can hold paintings up to 55" high. The price range for display easels ranges from $17 - $400. 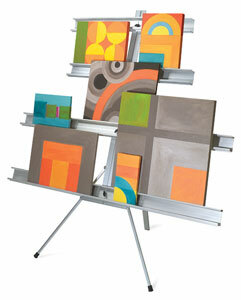 Display easels are ideal for: artists who need easels to display their work for a show or studio visit. 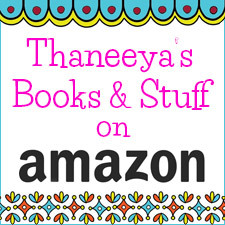 Let us not forget our tiny tykes, our budding Picassos! 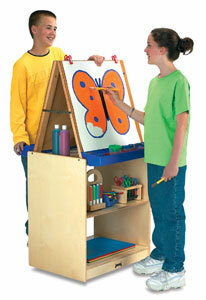 Children's easels are usually adjustable, so they can grow along with your child. Some models are 2-sided, so that two kids can make art at the same time. Some also have chalkboards, magnetic boards and/or dry erase boards built-in, with a replaceable paper roll that dispenses the paper over the top of the board. The price range for children's easels ranges from $35 - $400. 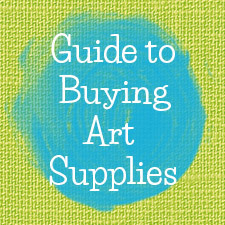 Learn about other art supplies via the guide to buying art supplies page.